Visiting the fetish market may not be everbody´s thing, but it is one of the easiest ways to have a small glance into a secret world which normally is unknown to outsiders. Though large parts of the population are Christians and Muslims, voodoo is still widely practised in Togo and major voodoo is concentrated in the Lome fetish market. The market is not larger than a tennis court but extremely interesting. 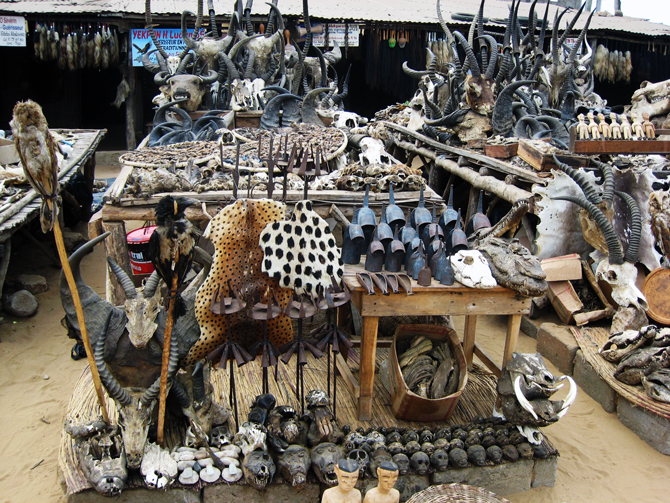 Here materials are traded which a fetishist needs for his animistic rituals, and as these items are mostly dried dead animals (or parts of them) the whole scenery looks macabre. The market is made up of small stalls, articles are presented on huge tables, on racks or on the floor. 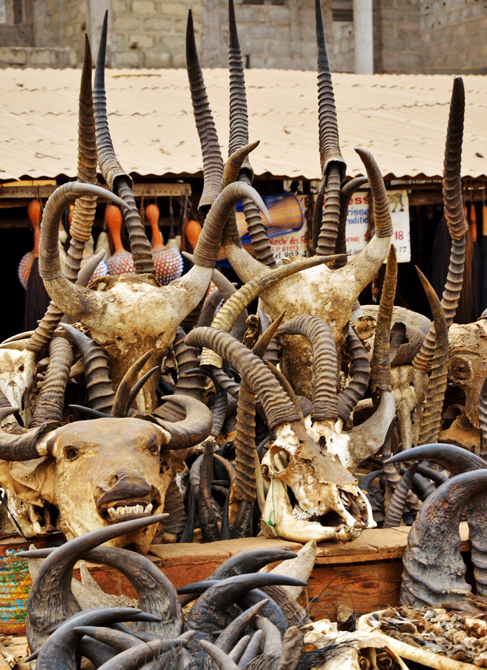 Carefully arranged collections of monkey, cat and buffalo heads, crocodile feet and tails, are surrounded by mummified birds. In between you find carved bones and wood, jewelery, snake skins, mussels, moonstones and iron ritual bells. If you are not interested in seeing the display you may consult or get treated by one of the voodoo priests waiting for customers. It’s all at your own risk.